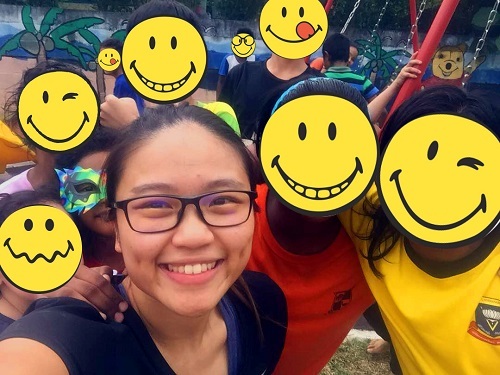 Our volunteer June, taking a wefie with the kids! June, a fitness coach wrote to us into our FB page as she desires to share her skills and experience to our children. She initially intended for a one on one session. However, we persuaded her to try taking on the whole group of the shelter 1 kids, she shared “the biggest group of children I’ve handled is just two to three kids!” Thankfully, she took the challenge on, just as Timothy and Raisa did with EDC. As such, Sanus Vitae (SV) was launched! SV are latin words that mean “Healthy Living”. SV’s aims are to first - improve the overall fitness of the children at Shelter 1. Second, to tie in the components of EDC in this programme so that there is a continual reminder through the week of what EDC aims to accomplish. Yes, that means the grouping of SV will be based on of teams of Super Power Dragon, The Awesome Five and Super Strikers. Moreover, there will be points attributed to the exercising activities in a competition with each other that will be accumulated with EDC’s points. Every Thursday afternoon for one year long, SV will be held at Shelter 1. With that, instead of just once a week, now it’s twice a week where the children will be reminded the values and benefits of unity, teamwork and servant leadership. June’s approach to the group exercise was broken down into two parts. The first half an hour is spent on strength, core, running or flexibility exercises that would be rotated week after week. The other hour is for the group exercise which involves the entire group. The exercise ranges from pumping, sit ups, planking and with some good creative twist to it as well. Some of the kids really go all out in working at it and well, some of them dread it because they are slightly overweight and unfit. 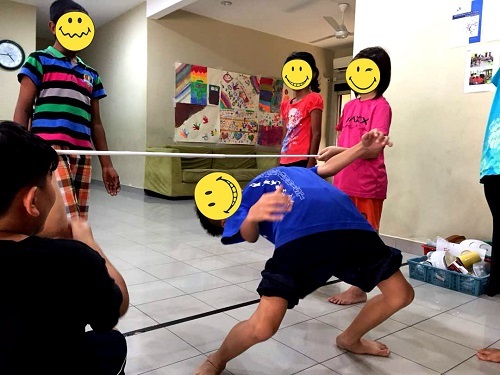 Although there were a number of challenges (which is expected), we also saw how the kids really encouraged one another. The Team Leaders of the group, especially William*, really stepped up in teaching the younger ones, Nelson* was taking full charge of his team and leading them with passion and Navil* was also teaching and busy giving instructions to his team members. Team Leaders’ Assistants Rosa*, Prem* and Prisha* were also doing what they can to help. Yet at the same time, lots of other issues also cropped up like being sore losers, blaming one another, attempting to cheat and refusing to participate in the exercise in fear of being seen as a weakling & etc. These became good opportunities to talk about lessons as well and tying in back to the objectives of EDC and at the same time, to reap the benefits of being fit as well. We want to specially thank June for being part of this year long programme and to share her time and expertise with our children!